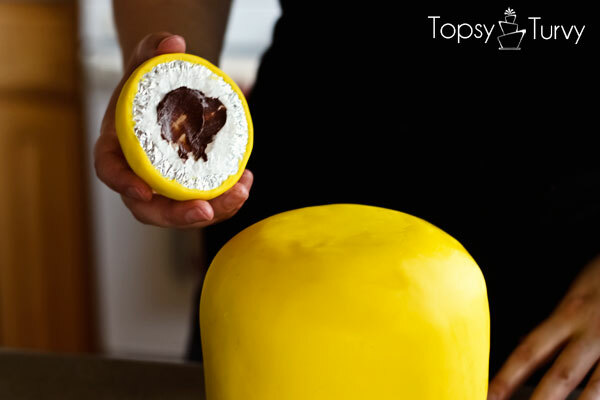 I shared my Rapunzel cake tutorial last year here at U Create and I’m so excited to be back sharing another cake tutorial with you! I made this same cake for my son’s 8th birthday last year and I get emails every week asking for instructions on how to make it! 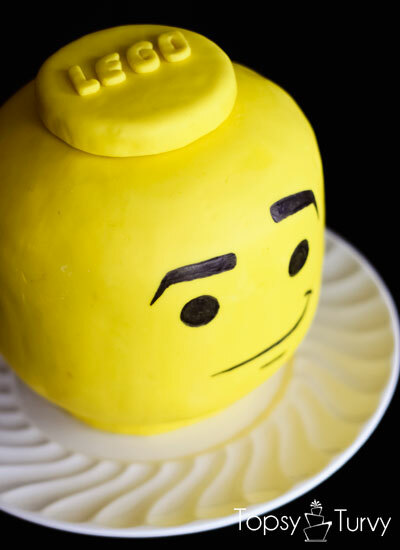 It’s a pretty easy cake, with a great impact and you can personalize it with any Lego face, or facial expression you want! So let’s get started! Cake circles! This is where it all begins… kind of boring, but an important preparation. My head was a 6 inch cake so I took a 6 inch cake circle and cut it down by an inch all around creating a 4 inch circle. I cut FIVE of these circles. 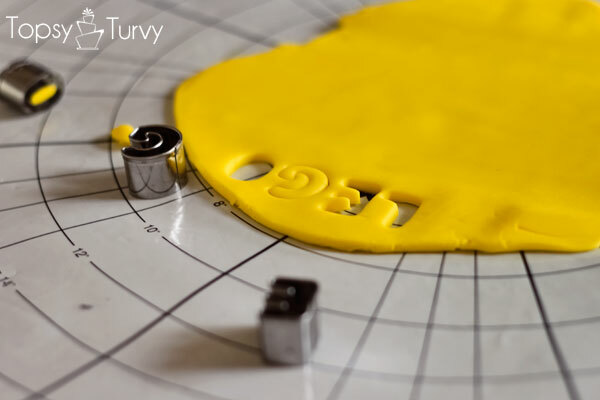 And now roll out your yellow fondant and cover your cake board! 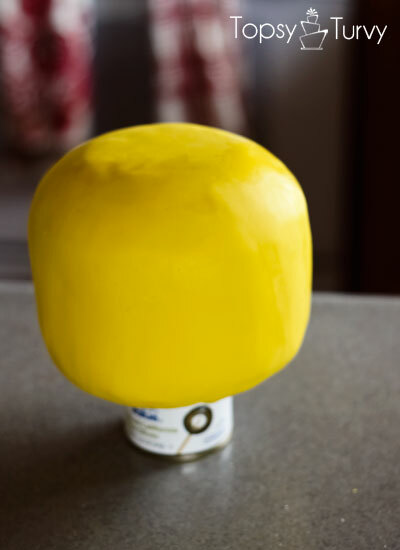 I buy my fondant pre-colored when I want a nice BRIGHT color. For more muted and pastel colors I color it myself. 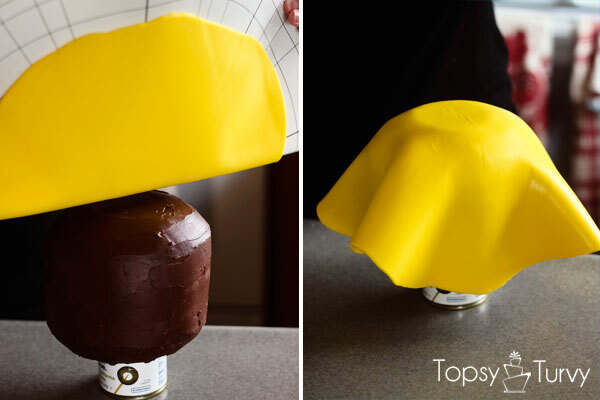 Here are some tips and tricks with preparing the fondant. Roll it out to just under 1/4 inch thick. 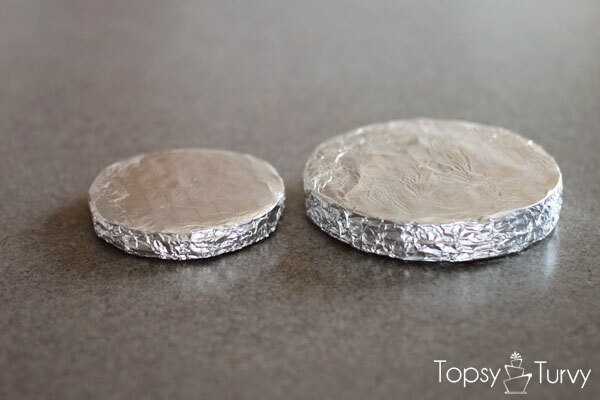 Cover your foil covered cake board with something sticky, either piping gel, or even light corn syrup works well! Mold it around the boards and cut along the bottom. Cover both, keeping the bottom edge as smooth as you can, after I cut my bottom edge I lift it up and take my finger and smooth it underneath all the way around. BUT I like taking a bit of extra time (and less expense) and making the lettering as close to the correct logo/font as I can! 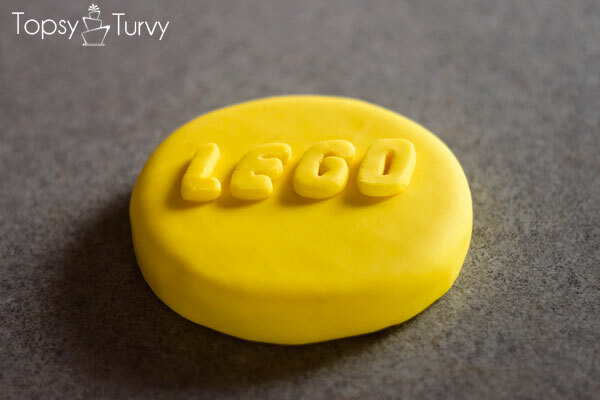 I downloaded this Legothick font and printed off a few different sizes and picked the size I felt fit the 3 inch circle the best. I rolled out my fondant again, closer to 1/8 inch, and placed my printed paper on top. Taking a straight pin I pushed the pin through the paper into the fondant along the lines. 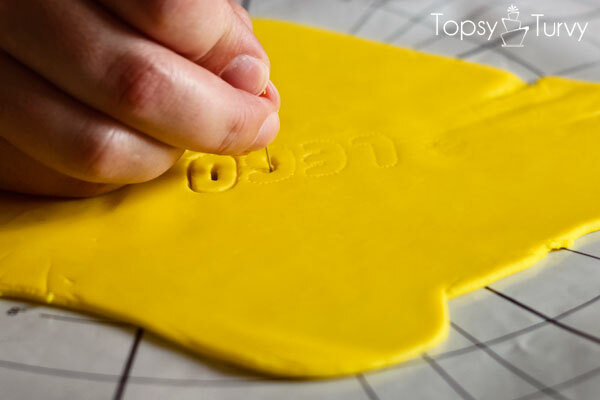 You’ll leave an impression in the fondant you can use for cutting out. 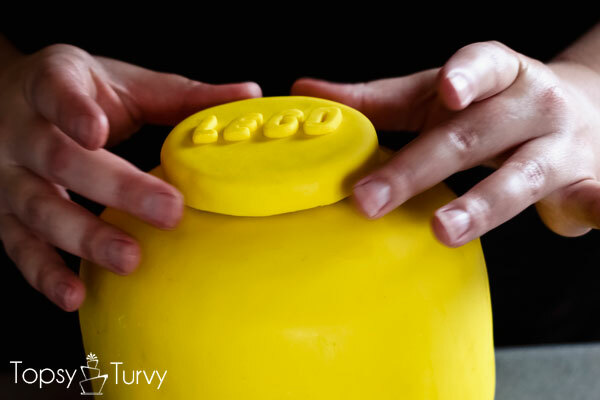 This will take patience, the fondant is soft and easily messed up, so just be patient! I placed the cut out letters back onto my printed paper, to let them dry a bit in the right formation/angle! Pretty darn perfect! Now for the cakes! I used two 6 inch cakes, each about 3 inches tall. 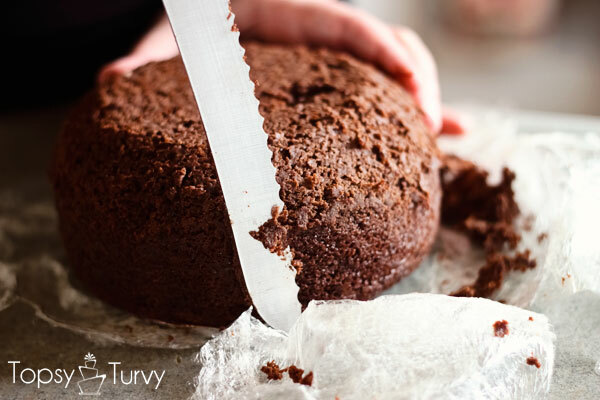 Using a serrated knife prepare the cake for carving by cutting off the top crusty part so your working with a clean surface/blank slate. Now we’re going to created the rounded corners. I took the same serrated knife and cut off the corner at about a 45 degree angle, all the way around leaving a nice 4 inch flat circle for the base to sit on. Next, cleaning your knife often, carve the smallest bit from the corner edges to round it just a bit, and soften the edges a bit. Since this is the bottom its going to be hard to frost once it’s right side up so I actually frosted the rounded bottom edge, then placed that one last 4 inch circled (covered with foil) on the bottom! I like to use ganache, it seals in the moisture and has an amazing rich flavor. 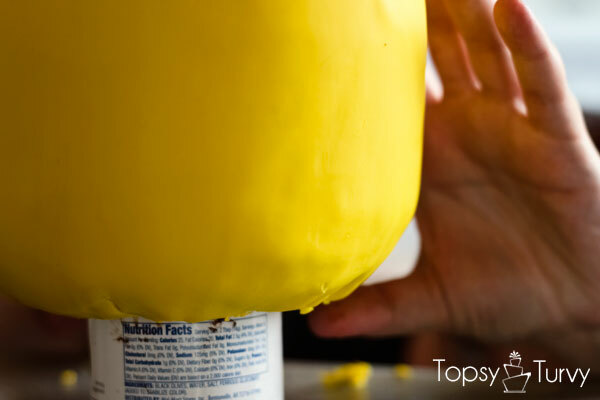 Since it dries quite dense you don’t have to worry about it squishing out when you put the fondant on it. Let the ganache cool down and to create a thicker frosting I like to whip it up in my bosch. 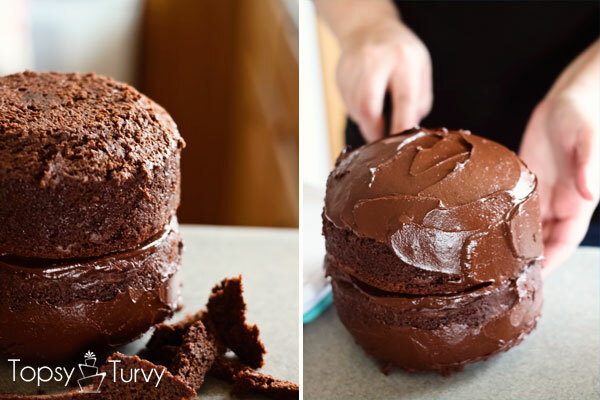 Flip it over, fill it with more ganache and place the next prepared layer on top. Now we’re going to repeat the carving to create the rounded corner again. 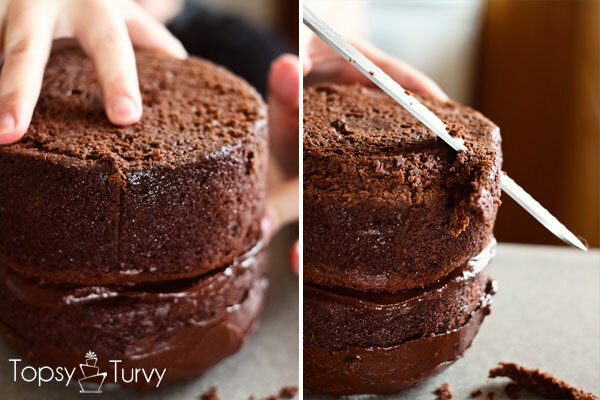 Once your done with the carving frost the rest of the cake, make sure to fill in around the seam well! Then let it dry, it will become more matte and lose the high gloss when it’s ready to go! Time to cover it with fondant!!! 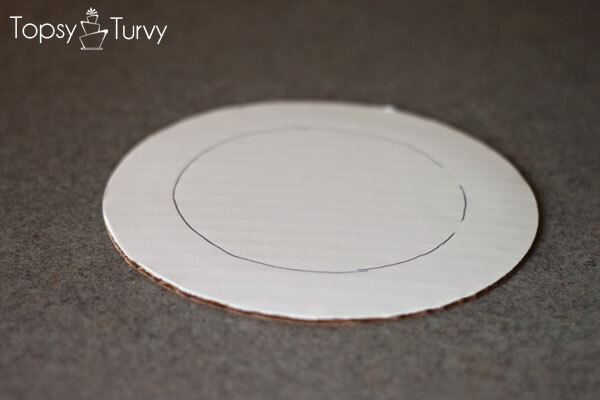 Roll out the fondant into a circle 1/4 inch thick. 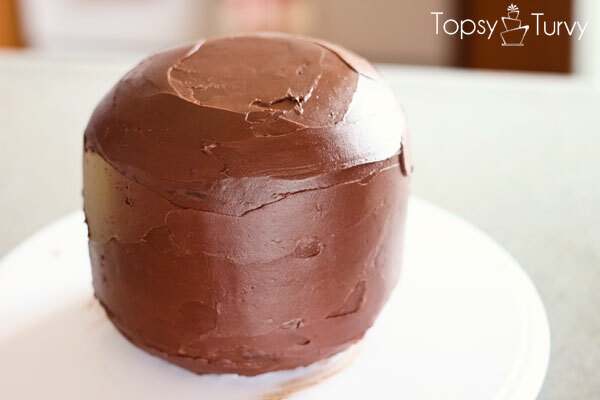 Since our cake is 6 inches around and about 6 inches tall you want close to an 18 inch circle. 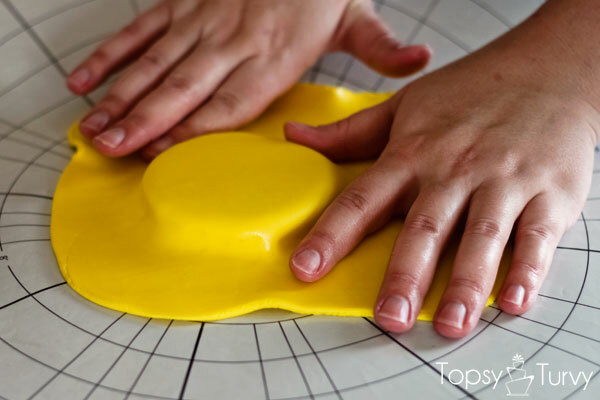 I like to fold my mat in half (fondant out) and lay the center directly onto the center of the to of the cake, then peel off the fondant and let it start to hang down the sides. 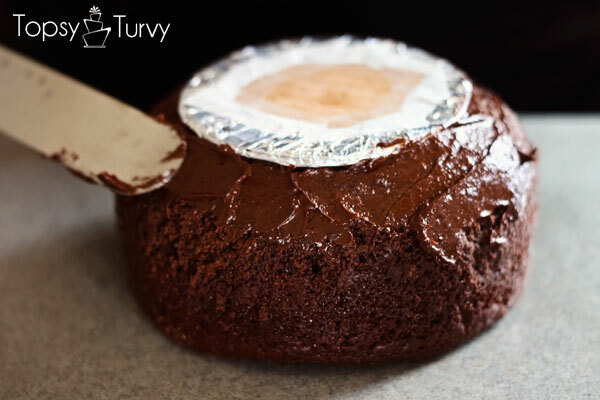 With our fondant so thick it’s also very heavy so we want to work as quickly as you can, but don’t panic, you don’t have to work at warp speed! 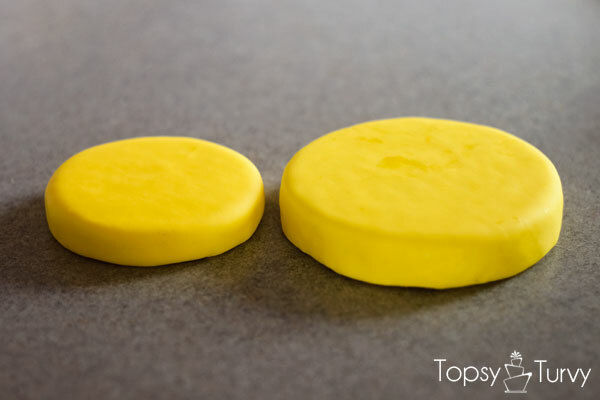 I start by using a fondant smoother (if it sticks to your fondant use a bit of powdered sugar to keep things dry and sliding easily) to make sure the top if flat, with no air bubbles. Now we’re going to work our way down. 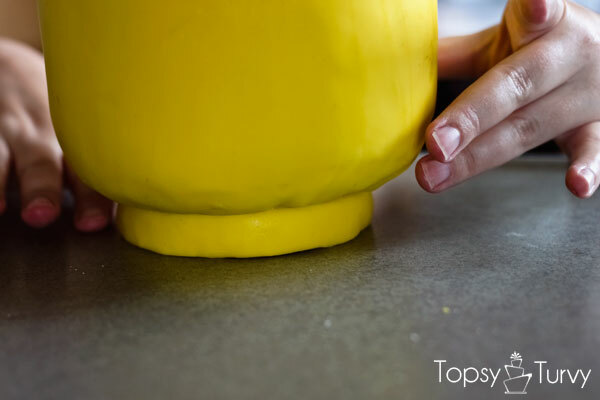 With your fondant thick it will press together without wrinkles as well as stretch a bit without ripping to help mold the fondant into shape. Don’t just work one side at a time, work a bit of one side, rotate, work more, rotate, work more, rotate, etc.. work your way down and around as evenly as possible. When you get it smooth down the sides take a sharp knife and cut along the bottom so the excess weight is gone and now we can work on smoothing it underneath! Now I used my plastic fondant smoother and just smooth out any bumps, imperfections, etc.. the ganache underneath warms and softens when rubbed and will just smooth right out! I LOVE working with ganache under fondant! 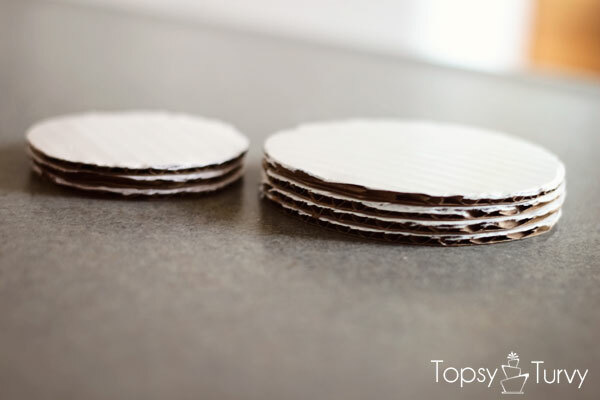 Add your top the same way, a bit of ganache dabbed on the bottom of the 3 inch wide top piece! 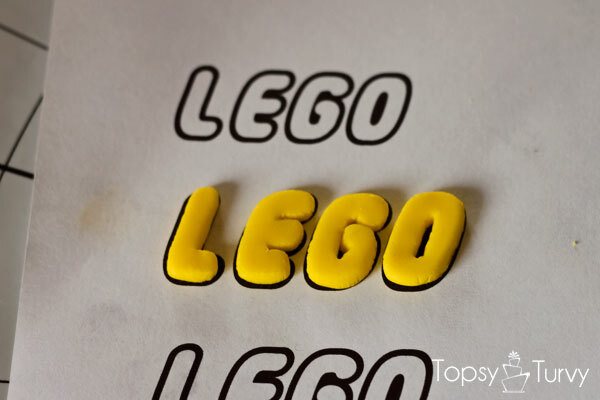 BEFORE you add the top pick the FRONT of your piece, make sure the lettering is facing the right way! 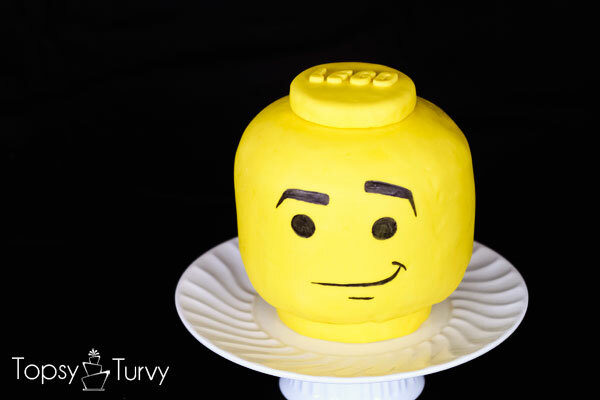 You don’t want your LEGO logo crooked, and you definitely want your face on the prettiest side of the cake! Voila!!! Now is the time to take a break if you want, let your hands relax, you don’t want to cramp up or shake as you draw the face on! Use this time to google Lego head images if you don’t already have one in mind! Draw it out on paper for practice. Then using a black edible marker draw it right onto your cake!!! 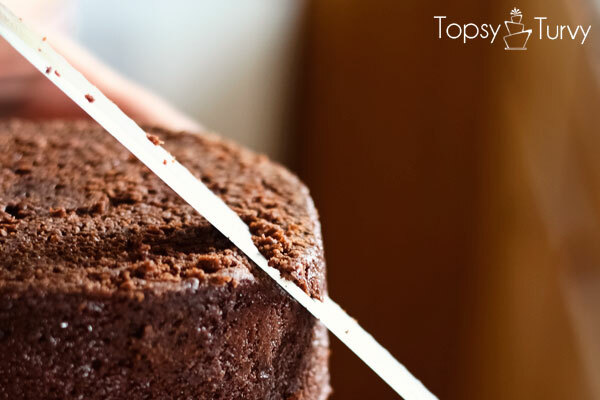 Start with thin lines- You can always add to the thickness of your lines, but once on your cake you can’t take it away! Now it’s time to serve and enjoy! Don’t forget to take the top cardboard off before cutting, and remember white it’s only 6 inches it’s TALLLLLL so small servings work just fine. This cake is made from 8 cups of batter- that’s 2 boxes of cake mixes so a little goes a long way! Ashlee! Your cakes are always incredible and it’s an honor to have you here today! Make sure to hop on over to Ashlee Marie Cakes to see Ashlee’s many party and cake ideas. If you like to crochet you’ll also be in for a fun surprise! 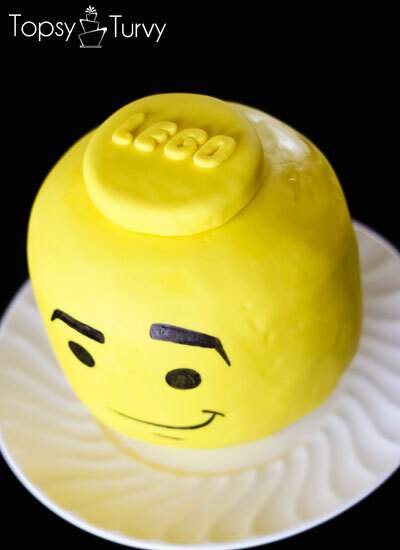 Hah- I literally just sat down to google Lego cakes when I saw this on Facebook. Love it! 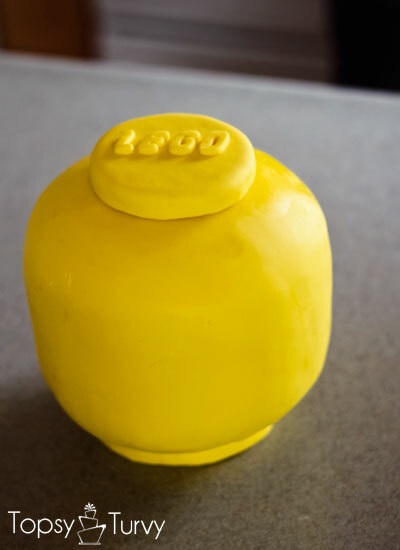 I’ve tried a few fondant cakes before so maybe I will brave a little cake shaping/stacking and make this one. Thanks so much for the detailed tutorial! Looks awesome!! My son would LOVE this! Thanks you guys! And thanks Kari for letting me come guest post! It’s always a pleasure having you Ashlee!